Ravi Parikh’s interactive timeline maps the lives of US presidents and reveals the overlaps in their lifespans. I have just come across this visual timeline by Ravi Parikh. It maps the lifespans of every US president and totals the number of living future, current and past presidents per year in a plot. It is a continuation of a visualisation he did the day before, which only included current and past presidents in any one year. From his description it seems that the first visualisation was drawn up to answer one specific question: what is the maximum amount of (current and past) presidents alive at any point in history. In case you’re curious, it’s 6 (1861, 1993 and 2001-2003). The second visualisation was encouraged by commentators and, I’d guess, without a specific question in mind. On the one hand it offers a more complete picture, because it includes the entire lives of presidents and not just the periods between their election and death. On the other hand, the lack of a question makes room for discovery. Ravi notes some observations, such as which presidents have been alive during which wars. It would be interesting to see those wars and also other major events somehow highlighted in the timeline. The timeline also reveals which presidents coexisted and therefore knew of each other and might even had conversed. For example, Theodore Roosevelt and Ronald Reagan were both alive at the same time. Although it is unlikely that 8 year old Ronald had a chance to chat with Roosevelt before he died in 1919. I would also be interested in the reason for the peak in numbers of presidents alive during the 1840s. Is it because presidential periods were shorter? Or is it just due to the fact that we can not know how many potential presidents are alive in current and more recent times because simply we don’t know who will become president in future decades? It would be useful if we could play with the lifespans of presidents more freely, for example to have the beginnings of all the presidential periods aligned or to keep some ‘landmark presidents’ always visible. 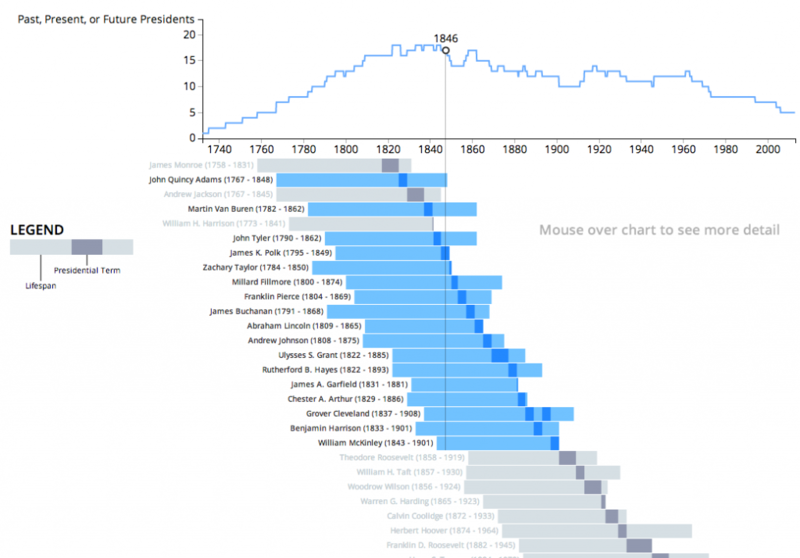 Currently, the passed away presidents scroll out of view when the cursor is moved in the overview plot. Incidentally it was this mode of navigation by linking a line plot to a timeline view that first attracted my attention. It’s not novel, but it works very well with both the visuals and the kind of data. I immediately started playing with it, scrolling back and forth and brushing through the data. It’s fun, as long as you’re not put off by the slightly morbid character of how the presidents all die the further you scroll.